On chilly days in San Francisco, when the fog covers the skies in a cool grey, and there’s a light drizzle of rain, there’s nothing like a chunky chili or a good ole fashioned stew to warm your hands with. How about stew with a twist? Using pork stew meat and a few ingredients, I adapted a recipe to make a Thai-influenced dish that perfectly suited the day. Add in crock pot, a little time, and Sriracha sauce, it was a bit of warm bliss. Slice pork loin into one inch chunks, removing most of the fat. 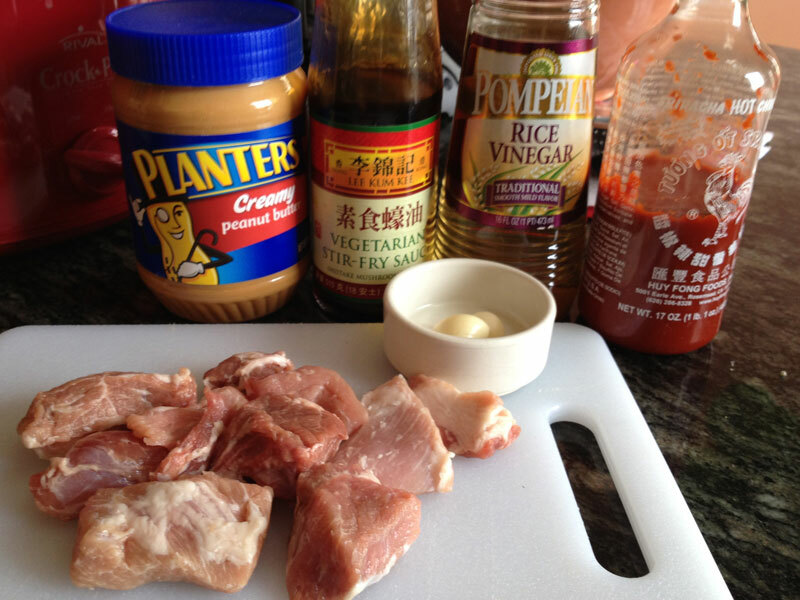 Combine with 1/2 cup of stir-fry sauce, 4 tablespoons of rice vinegar, 1/3 cup of peanut butter, three minced garlic cloves, and a heavy dollop of rooster sauce. Heat on low for 4-5 hours until the sauce is a creamy thick brown and the pork shreds easily with a fork. Add a little beef broth if the sauce is too thick. Lightly sauté vegetables then add to the crock pot. Mushrooms and carrots are always a staple in my fridge, but a red pepper would have been a nice touch. Let the stew sit for another hour, but check it frequently. Season with salt and pepper to taste. Serve over Jasmine rice, topped with a sprinkle of peanuts and a squeeze of lime and enjoy! 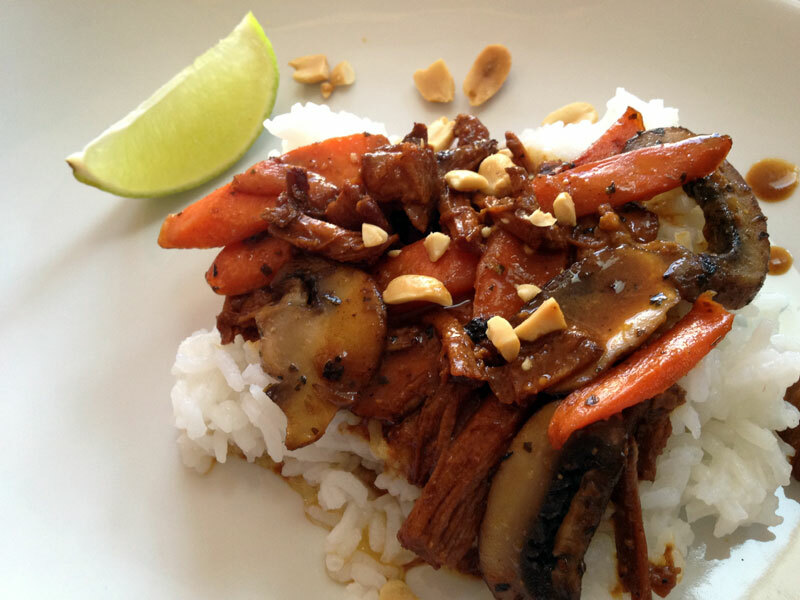 This entry was posted in San Francisco, Taste and tagged cat, crock pot cooking, do, pork stew, taste, thai food inspired stew, winter recipes. oh wow. I can’t wait to make this. Thanks Melissa, let me know how it turns out! Wow – smart for us guys to make since most of these ingredients are already in our fridge. Hungry again, and I just had lunch. Thanks for a quick & easy recipe! Looks so yummy! Gonna make this for dinner next week!